With no upgrades to buy for your car, the only means of progress is to get the hang of the Project Gotham‘s particular plays-style, which puts the spotlight more squarely on the handling model – thankfully one of the best things about the game. 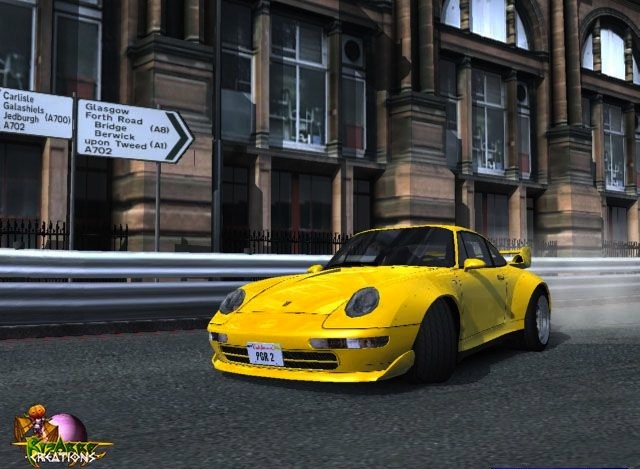 While it’s standard-definition graphics (positively photo-realistic for the time) were always going to age horribly, I still haven’t come across a game where the simple experience of driving the cars is more enjoyable than in Project Gotham 2 (and that includes its own sequels). The close walls can be unforgiving to begin with but the rhythm of brake/acceleration soon becomes inbuilt and your variation on that comes from the track and the car but also from how you want to approach each corner. Do you want to smoothly turn-in, kiss the apex and carry as much momentum as you can through the exit, narrowly avoiding the outside wall on the straight? Or do you want to jam on the brakes, spin-up the wheels and swing your tail around the corner while pointing sideways? That probably depends on the event and your mood but most of the time both approaches are equally valid. As you get better, that decision gets made in the millisecond before you brake as you instinctively make judgement calls on whether you’re too late or early, whether you’re going fast enough, whether your car is stable or still rocking from the last corner. Playing from the bumper cam is usually my favoured way of playing racing games, even if in PGR it means missing out on seeing the immaculate model of your car. Yet even though the car you’re driving is invisible from that viewpoint, it feels like a solid, living creature. The camera follow every little movement: pitching, diving and rearing up with every prod of the throttle and brakes, rolling from side to side as the springs work through the corners. You’re never unaware of the vehicle’s weight as the handling model forces you to constantly consider it and do what you can to either shift it into action or try to settle it down. The life of the car is transmitted brilliantly through the much-maligned Xbox controller. If Bungie showed how the Xbox’s responsive analogue sticks could be used for first person shooters, PGR2 demonstrated how much analogue triggers and force-feedback could add to racing games. The Dreamcast was the first console to introduce analogue triggers and Bizarre’s Metropolis Street Racer made good use of it. The Xbox had similarly springy triggers with a large amount of travel, letting you feel exactly how much throttle or braking you were applying with a great deal of sensitivity. In turn, PGR2 is a game that demands you use that instinctive feel to master driving. Meanwhile force-feedback, packing quite a punch on the Xbox, constantly communicates with the player in ways the visuals never can. Slightly uneven paving stones under your wheels might pulse the controller, while gear changes jerk it. Most usefully and thrillingly, the controller practically throbs in your hands when you’re too heavy on the accelerator and the wheels are scrabbling for purchase – it almost feels like the plastic is trying to kick its way out of your grip and a heavy right index finger, without some careful steering, will probably lead to the car similarly rebelling from under your spell. In spite of the choice of setting and cars, perhaps the best tricks you can use come from the world of off-road rallying. Often the quickest way to hustle a car’s mass through a tight turn is to shift it into instability before hand or apply a dab of handbrake or spin-up the rear wheels till the back of the car comes alive and swings round. They all become naturally learned techniques in your repertoire and the controller feedback ensures you can keep your vehicle on the thin edge between performing a controlled-slide and spinning-out. The cars that best show off this union between controller and handling model are also the ones that demand the most in terms of concentration and trigger control – not, as you might expect, the exotic hypercars but instead the classic American muscle-cars. Their considerable heft and soft suspension give them boat like handling, rocking and bouncing at the slightest provocation. Their overpowered engines and low grip mean that the right trigger is carefully monitored at all times, any hint of controller shake causing you to either back off or attempt to use the sliding rear. Either way the level of concentration required is uniquely punishing and rewarding. All of which brings us to the mode that PGR2 introduced and remains the best expression of Project Gotham – the Cone Challenges. Here driving meets Tony Hawk and becomes like an extreme sport. There aren’t jumps or incredible stunts and you don’t get to create your own lines to run through – there’s pretty much only one tightly prescribed route. But finding the way to master each track and putting together a perfect run quickly becomes an obsession. Speed isn’t the ultimate factor here, although it’s undeniably important. Driving precision and control are what’s most important in order to get through the cones, while speed keeps you chaining them together for the combo-score. Power-slides can keep your score ticking up too, particularly when you want to buy yourself a half second or so, but since you still have to thread them through the cones they can’t be overindulged – you need to be confident in any slide’s trajectory, angle and end-point once you’ve started it. Pull all of that off, consistently, with no mistakes, and on certain tracks the resulting replays can look like automotive ballet. The Cone Challenges don’t feel like a competition but instead a performance, with your own inner perfectionist harrying you to hit retry until you get that flawless run. It’s the mode that best illustrates and justifies the series’ raison d’etre: the Kudos scoring system which looks at how you drive rather than how fast. The game’s Kudos scoring system yet another part of the game that’s been carefully judged, the perfect example of balancing risk and reward. Any time you score, by going through a cone gate, completing a clean sector, hitting an apex, pulling off a slide etc., you have a window of a couple of seconds to keep the combo going by scoring again. Usually this keeps you racing through to reach the next scoring opportunity – if you miss that time window you simply bank the points you have so far. The combo score increases massively as the chain gets longer though, with each subsequent ‘trick’ bringing ever greater amount of points. If you mess up though, by hitting a cone or a wall, you lose all of the combo score you’ve built up – so the pressure builds with every little on-track success. It’s all too easy to hesitate, whether deliberately or not, and simply bank what you have, starting a new combo from scratch – but the only way to hit the higher medal scores is to plough on through, to twist instead of stick, to keep gambling on your own ability and hope you can hold on to your combo score as it climbs ever higher. PGR2 does something interesting with the medal system too – before attempting an event you have to choose which medal you’re aiming for, from copper to bronze through to platinum. If you don’t make that medal’s score target, you don’t get given the lesser medal, you simply fail. If you pass and happen to get a platinum score while aiming for gold, all you get is a gold. It might sound unfair but it’s way of getting the player to set the pressure on themselves. There are many times when I’ve repeatedly tried for a gold and eventually given up and gone for the silver. Inevitably, with the pressure off, my silver run-through would then be near-perfect and my score good enough for a gold-medal – if only that’s what I’d gone with. It’s like the high jump – it doesn’t matter if you clear 2m when the bar was set at 1.5 – you’re score goes down as 1.5. Nowadays the consensus in game design would say that’s too frustrating for the player – just give them what their score tallies too. But Bizarre, as with the Geometry Wars series, understands the psychology of players and how to induce that “one more go” mentality. It’s crucial, for example, that PGR‘s Restart option is always instant with no loading time whatsoever – undoubtedly that was something they strived for early on from a technical standpoint. 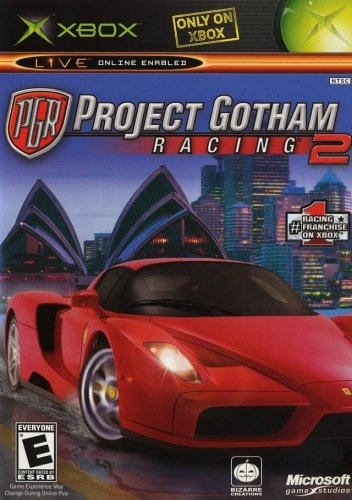 Project Gotham Racing 2 is a game that’s had a lot of thought put into it at every possible stage. I could go on about the range of fastidiously reproduced cities that provide the game’s backdrop; the atmosphere of flicking between the sunlit roads and skyscraper-cast shadows in a deserted Chicago; the thrill of winding through narrow cobbled Edinburgh streets at night. 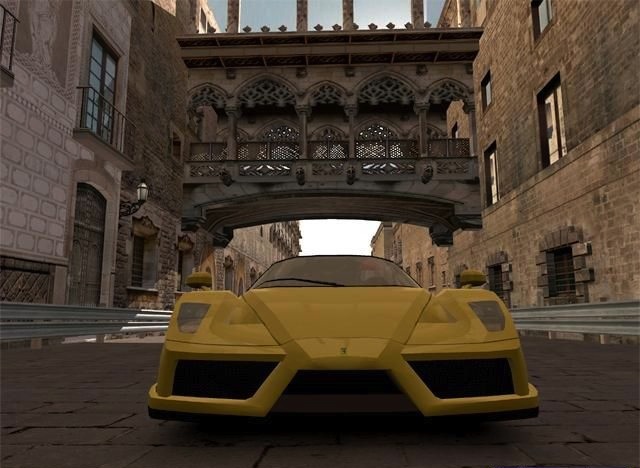 I could mention the impact the game made online, changing the way people thought about online gaming for both consoles and racing games with the player community effectively creating their own modes. I could branch off to talk about Geometry Wars, the little in-game easter egg that re-introduced dual stick shooters to the mainstream and became a critically acclaimed series in its own right. Ultimately though, what’s stuck with me most from PGR2 is the moment-to-moment driving. It’s best encapsulated in the singular experience of burning round a corner with headlights, tyres and tarmac all pointing in different directions, wheel-spin shaking through the fingers and the car never completely tamed, all while the ticking sounds of the Kudos-meter collapse together into a crackle, like a happy Geiger counter. Do it once and you’ll never lose your taste for it. Great Post, As one of the few xbox games I owned, I played PGR2 to bits, and still play it to this day. I think the graphics have held up well – the level of detail put into the environments puts most newer games to shame, the best probably being Moscow in its stunning early morning lighting. The cars are nicely modeled too – with the exception of the Bentley Continental Gt, I don’t know what happened with that car but it looks awful! Thanks for the comment. I think PGR2 is still fairly good looking although compared to HD era games its resolution shows up pretty badly – but I agree the combination of art style and locations made for some great moments.